Good news for lodging business owners! 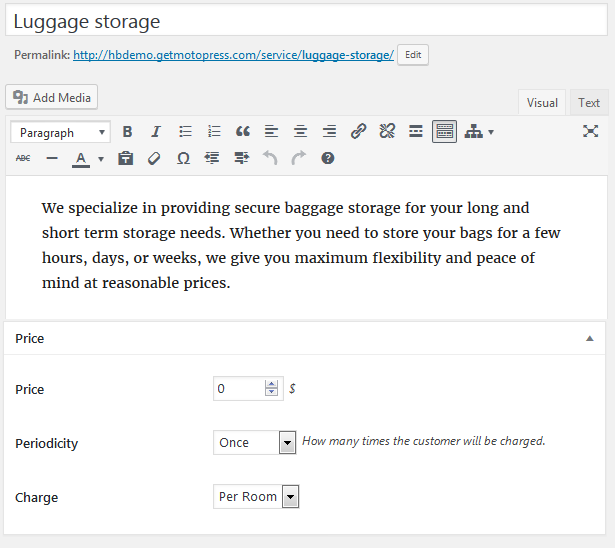 We’ve expanded the product line with one more awesome plugin – WordPress Hotel Booking plugin. 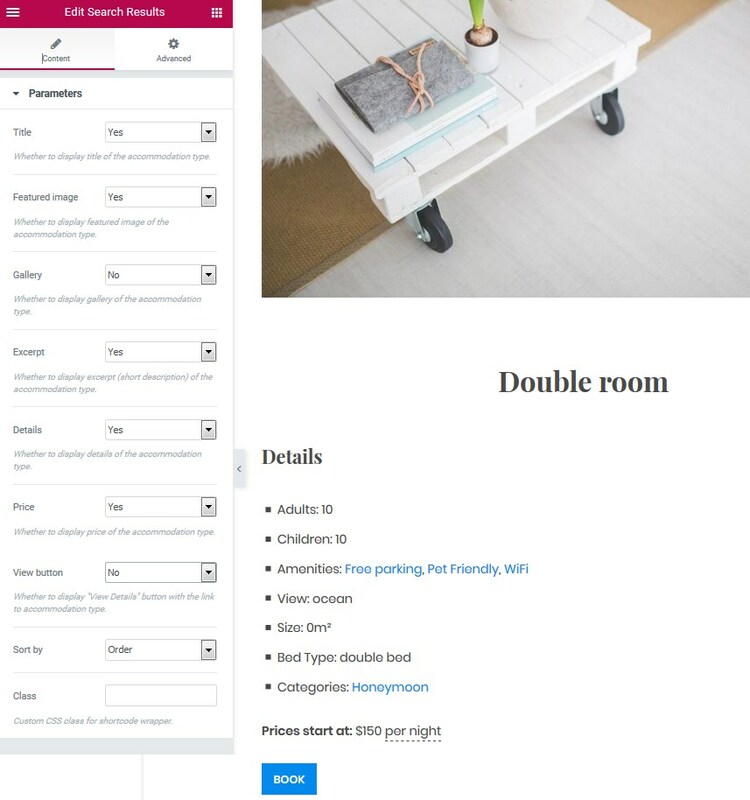 If it’s your niche and you are thinking about delivering new conveniences and services to enhance guest experience of your property rental WordPress website, or have not even started building a hotel website yet – our MotoPress WordPress booking plugin is ready to perform both tasks. It will help roll up your hotel communication and management into one platform and do your business much easier. The plugin is not limited to implementing an online booking service alone – it’s a complete WordPress booking solution for featuring rooms, rates, services and other information to properly present your entire lodging establishments. MotoPress Hotel Booking Plugin = advanced PMS + Online booking engine + Real-time availability calendars + no-commissions OTAs channel manager. 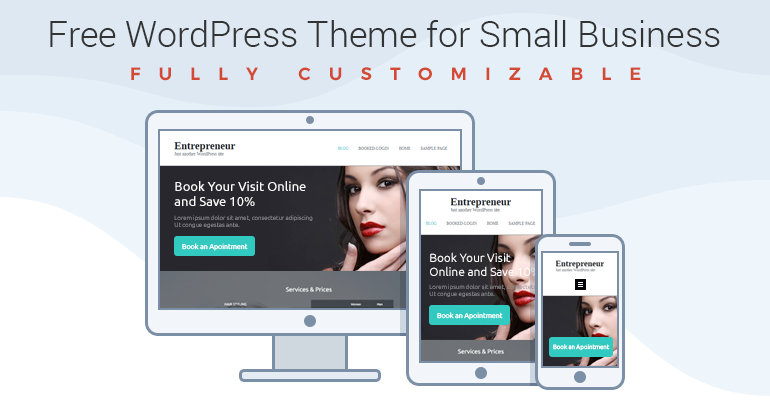 All under one roof on your WordPress website! If you’ve got a WordPress website set up (in the process or just thinking about it), a bit of inspiration and a cool plugin we are talking about, you may just start plain sailing from this post and see how you can create your hotel website with less efforts. But at first, let’s dive into the main features and opportunities of the plugin. No matter if you run a huge hotel with multiple rooms, a small hostel or a holiday rental, you are free to present any room types in the best light. You may add a room type title and description, in-room facilities, capacity, bed types, etc. You can also supply each room type with an individual gallery to show all details and advantages of a room. – personal data to complete a booking. In the hospitality technology sector, mobile use for reservation continuous to rise. Today, nearly 60% of travelers book hotels using a mobile device and this number is increasing. We made sure that your site pages created with our plugin will look properly and stylish on each screen, making it really easy for modern travelers to book a room on the fly. Usually, there are tons of extra services a lodging establishment can provide. Some of them are better to be preordered while booking a room. With this plugin, it’s an easily doable task. When setting up a room type, you can tie the available services to it and show them on the Reservation page. Basically, guests add extra offers to the cart just like they add a room. The plugin settings also allow you to set the charge terms – whether a price charged for a room or a person and how often (once or per night). A great way to make guests feel that they are offered more than usual. Moreover, a great way for you to gain additional revenue! The content created with plugin will look like a natural part of your theme design, so there is no need to adjust styles additionally. Just do your content work, design will look great. Update! 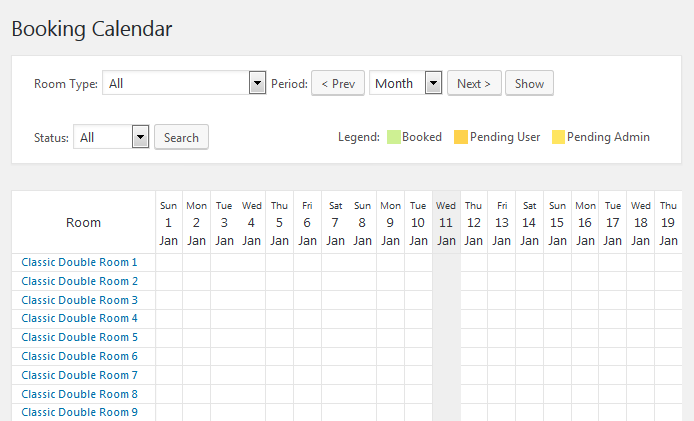 We’ve added 15 different themes for the Search Availability calendar, so the plugin will look even better in your theme! Of course, the pricing in your hotel depends not only on the world economic situation, a stay-in may be cheaper in winter and more expansive in summer or vice versa. 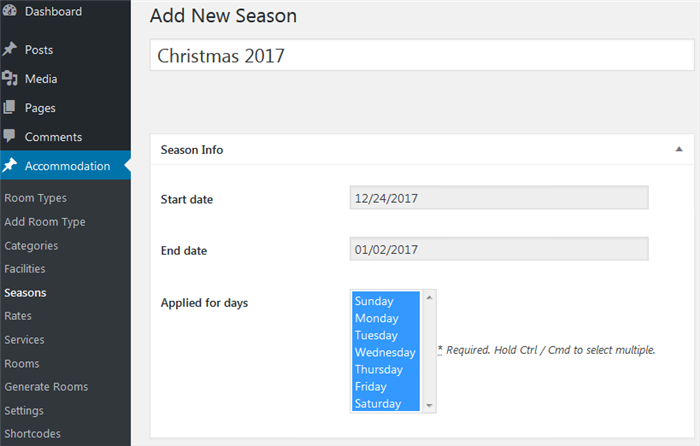 That’s why the plugin lets you divide a year into different “seasons” (fully customizable option – this can be a month, year, day, couple of days, etc.) and set different prices for each of them. 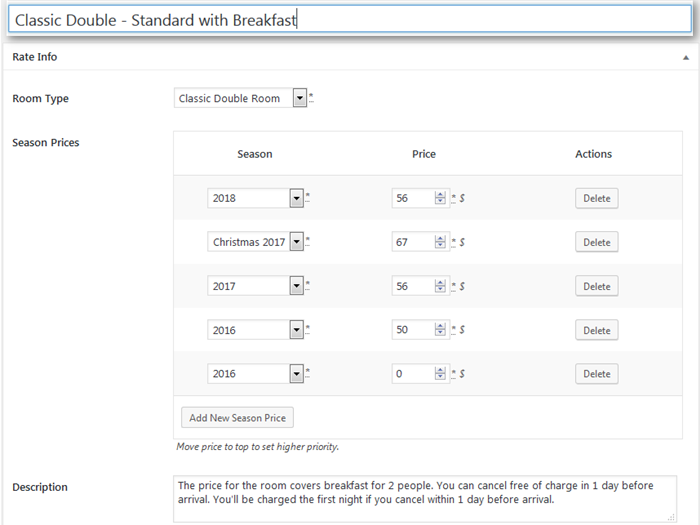 Once the seasons are added, you’ll be further able to add prices (create rates). Want to present the same accommodation type but with different benefits or payment terms? 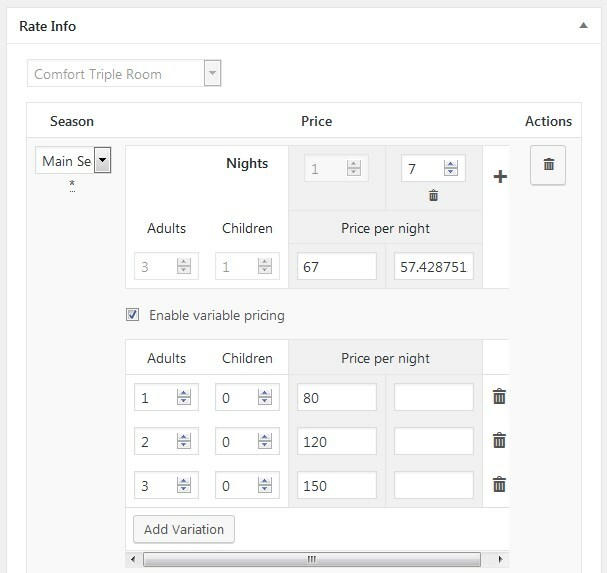 No problem – just set various rates for the room type and let guests choose the most suitable for their search requirements. This may be a double room standard refundable vs double room standard not-refundable, for example. Simply supply each rate with a description and your guests will be able to understand the difference on the checkout page. For example, a base daily rate is $200 for a room with a max occupancy of 4 people. If only one guest wants to rent this accommodation, you can lower the base price according to this parameter (e.g. $150 per room if only one guest is arriving). If there are a lot of real accommodations of the same accommodation type in your lodging, you may add the same ones in clicks without doing a repetition work. You can generate a needed number of rooms when adding a new room type or under a separate section Accommodation > Generate accommodations. When everything is set up, your WordPress lodging website is up and running and new booking requests arrive, you may view all of them in Booking calendar – it makes it easy to quickly sort all bookings and find the needed one with any status. Moreover, you’ll be able to see a detailed payment history of all individual bookings (along with the customer details). 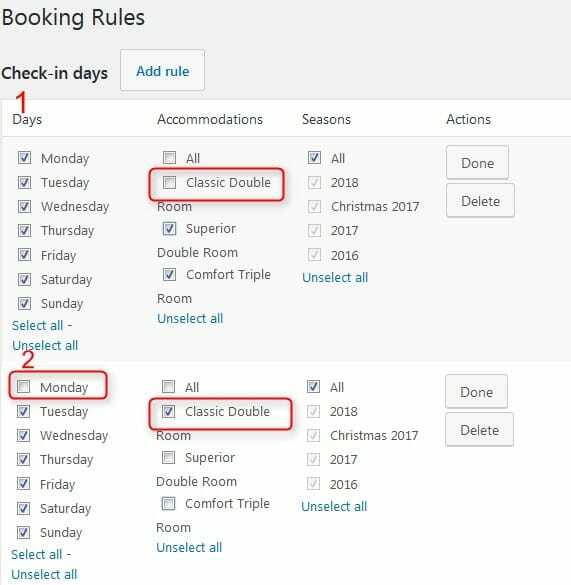 The system of booking rules is very flexible and you can tweak it in different ways. 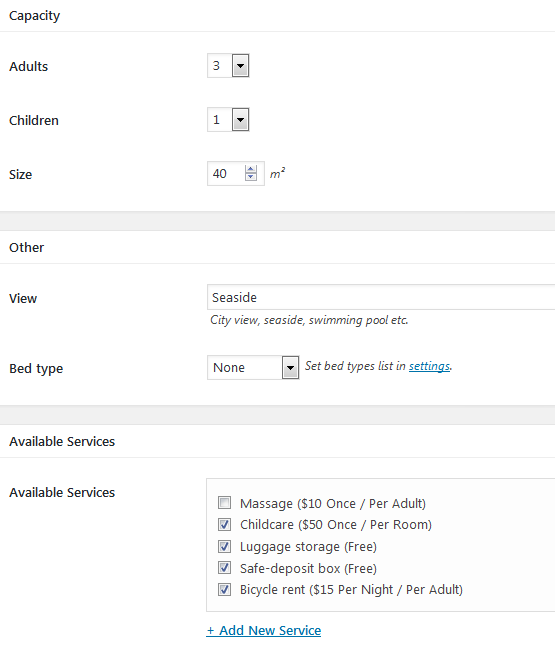 You can set custom booking rules for the entire lodging establishment as well as for individual properties. Configuring general settings you should specify maximum and minimum stay-in term possible in your property. However, if any planned or unexpected events take place (like full hotel reservation, maintenance), you may set custom booking rules for specific periods specifying not check-in, not check-out and not stay-in dates. Ability to block accommodation types / actual accommodations for a specific period of time. If you want to provide your loyal clients with discounts (or lure more prospects), you’ll be able to create those coupons easily in the admin dashboard. Lots of coupon customization options are available (percentage and monetary values are possible). This is a new feature we released in October, 2017! If you rent out your accommodation on the platforms like Airbnb, you can synchronize all direct website bookings with those from OTAs via iCalenedar. 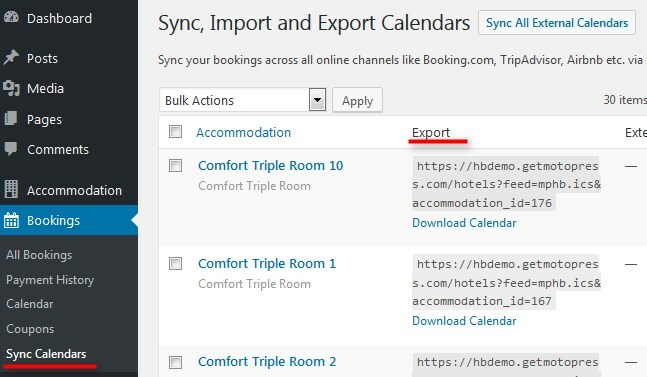 So, to avoid overbooking you’ll need to import and export iCal links across OTAs and your website admin panel. 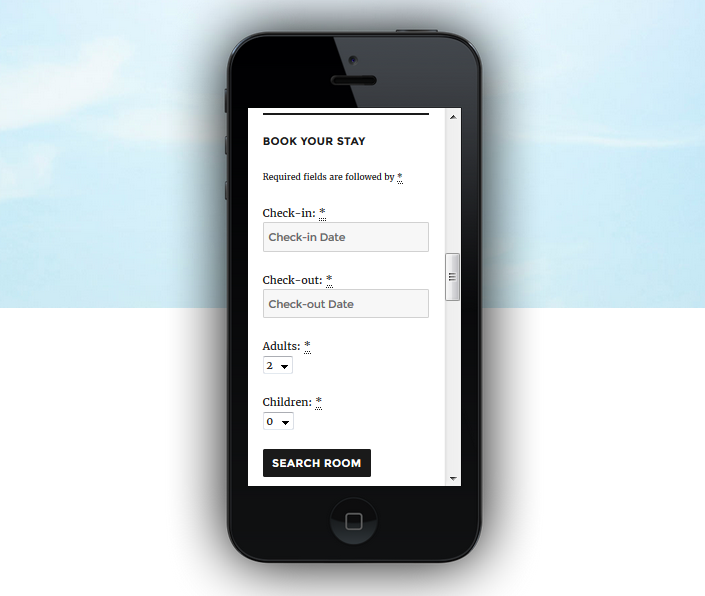 Optionally, the synchronization of bookings is automatic – you can set the system how often it should be updated. Find more details on how to sync your WordPress hotel website with online travel channels in this post. 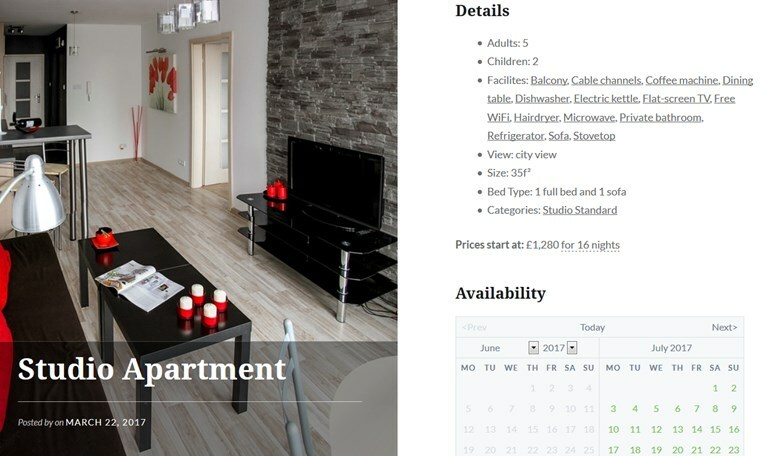 Unlike other WordPress booking plugins for rental property, MotoPress Hotel Booking comes with several built-in payment gateways – PayPal, 2Checkout, Braintree, Stripe, Beanstream/Bambora. You may enable them on your property renting website without extra charges. However, if you need to implement any other payment method, we’ve made it a really easy task to do – you can use a specific WooCommerce Payments addon that will help you integrate Hotel Booking with numerous payment gateways available in WooCommerce. 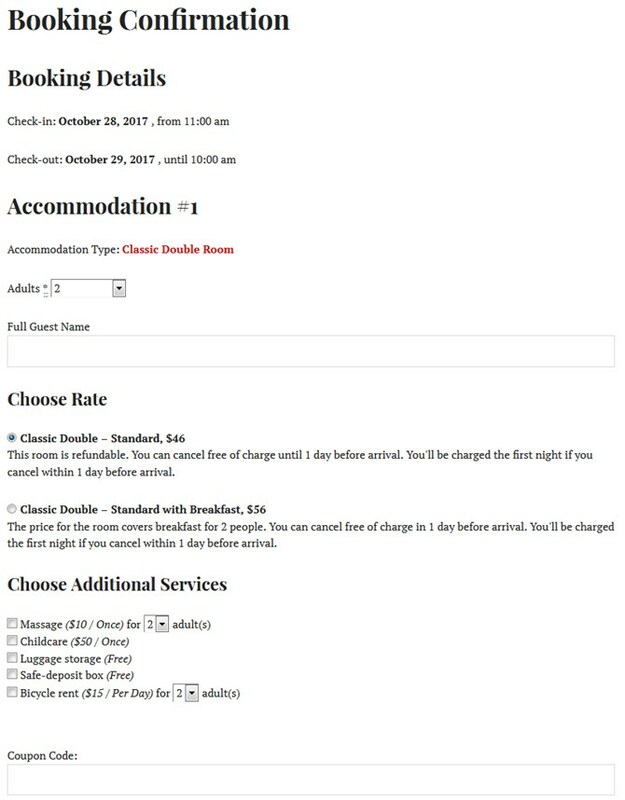 Since we mentioned the WooCommerce Payments addon for our plugin, it makes sense to take a look at other Hotel Booking plugin addons. As for now, there are two more of them. 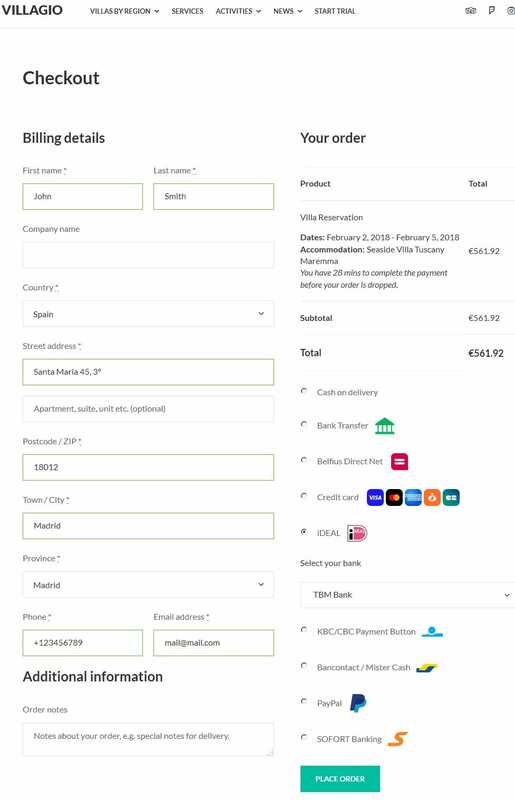 The first one, Hotel Booking Payment Request addon, will let you send emails with payment links to the guests who have confirmed booking of your accommodations and collect upfront payments to secure the reservations and prevent no-shows. The second one, Hotel Booking Reviews Addon, enables users to review and rate your accommodations and properties. You’ll be able to fully moderate and reply to submitted reviews. You can find more details of how to add and manages taxes and fees info in the this update review. 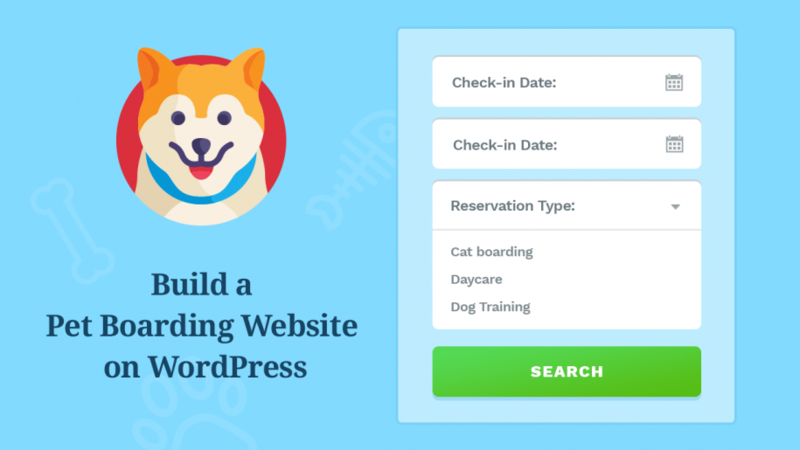 One of the new features of this WordPress booking plugins released in June, 2017! Your guests can reserve multiple rooms at a time – during one reservation process. 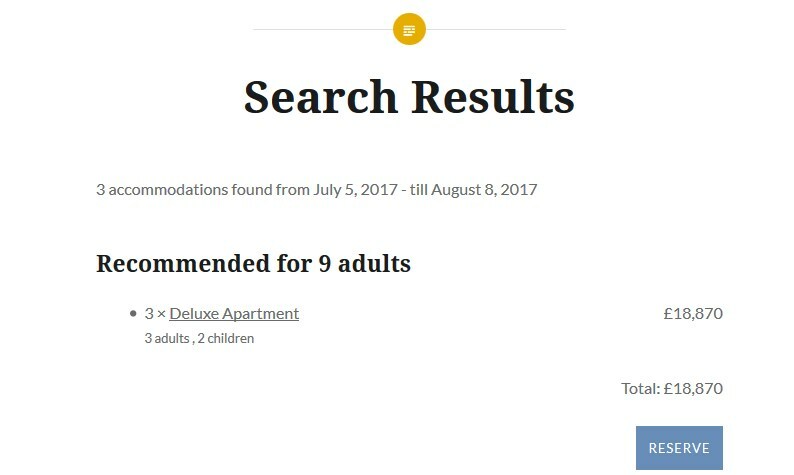 Moreover, you may set the plugin to recommend the best set of accommodations according to a number of guests – or, if the guest doesn’t like the recommendations, they can choose the needed ones from the list manually. You may choose who confirms a booking request – administrator or a user. If you want to have a full control over each request – set admin confirmation mode and approve each booking manually. Otherwise, let users click on a confirmation link to confirm booking automatically. If you are going to accept online bookings, you can set a confirmation upon payment mode (once your guest paid a deposit or a full price online, the booking is confirmed). You can also customize the appropriate emails for admin and user (like confirmation, cancellation notifications, etc). It’s easy to make your emails more brand-looking as you can set colors and upload your logo along with adding your text content. If you are still running on the older WordPress versions that don’t include Gutenebrg, you can add shortcodes the traditional way in the TinyMCE editor. 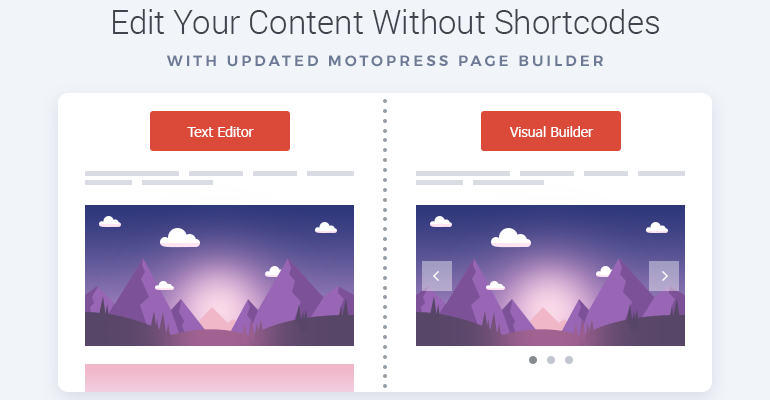 Under Accommodation > Shortcodes you have a full list of available shortcodes to copy / paste to the needed pages when the rest of content is already added. Each shortcode comes with a clear explanation of how it works so you should not get lost. However, since version 3.1.0, the plugin comes with full Gutenberg support letting you add and edit shortcodes as Gutenberg blocks! Read more how it works in this post. 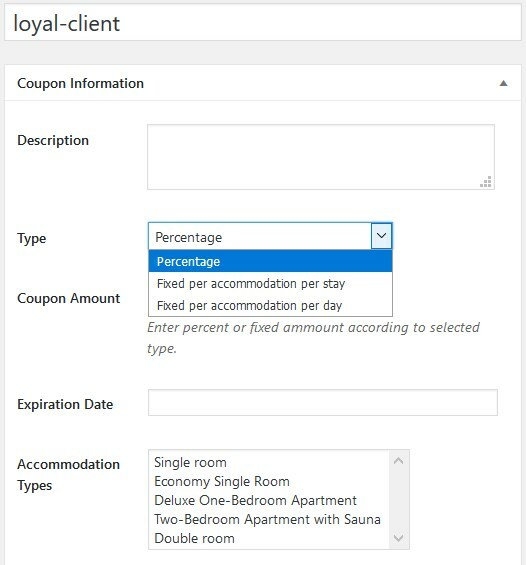 The good news for Elementor Page Builder users – you can add and edit MotoPress Hotel Booking shortcode parameters visually in the page builder. If you want to benefit from this integration, you’ll need to download a free Hotel Booking Elementor plugin. Read more about integration with Elementor. 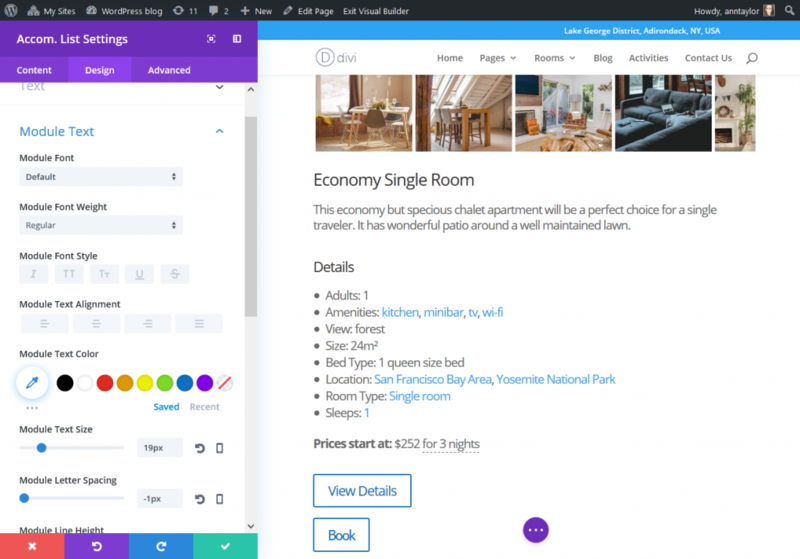 Divi Builder fans also have a reason to choose MotoPress Hotel Booking since we offer a free integration add-on to add and customize shortcodes visually via the Divi interface! Learn more about it in this post. The plugin is available in Portuguese, Polish, Russian, Spanish, Turkish, Swedish, Italian, Hungarian, Czech, Chinese, Dutch, French, Arabic and German. So a language will be automatically updated according to your global WordPress language settings. You can also add custom translations via the WPML plugin. To recap, MotoPress Hotel Booking plugin for WordPress is an awesome solution for building a sustainable lodging business online – from giving your hotel great visual attractiveness online to complete control over property management and room reservation services. 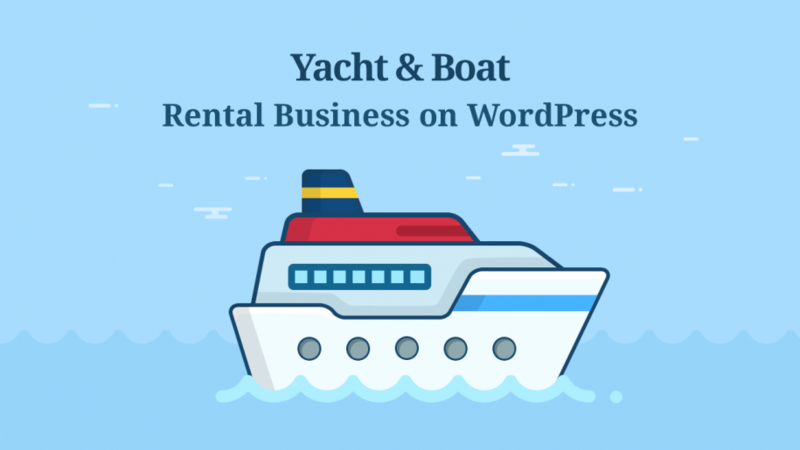 We are polishing it for several years already to provide you with all on-demand tools required for running a hotel and property rental business with WordPress. So, if your hotel occupancy rate leaves much to be desired, probably you should start fixing it today? We’ve also prepared a step-by-step documentation for you to get started easier and understand the logic of the plugin faster. Interested how it looks and works in the wild? Take a quick look at the frontend and dashboard. You can optionally get all of them at one price within MotoPress Membership (perfect for developers and users who need all paid add-ons! ).